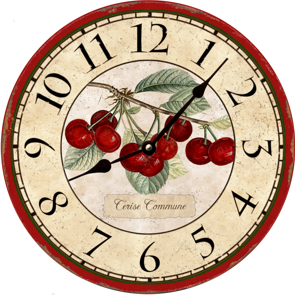 French Cherries Wall Clock in vibrant red colors and charm. The perfect wall clock for the kitchen or room in need of an elegant touch. This medium wall clock is exclusively hand made in the USA with fade-resistant inks, the artwork is carefully mounted on a laser cut 1/4" thick wood panel. A special UV resistant coating is then applied with a brush for a durable textured finish. This lovely clock is custom made and will be available to ship within 5-10 full business days.